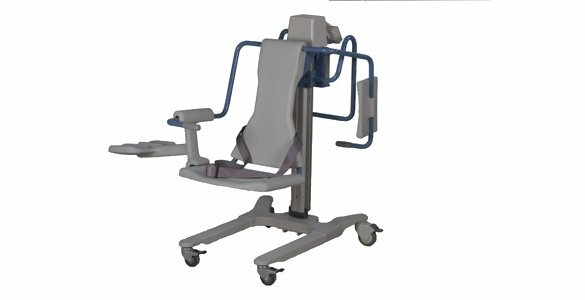 The GK hektor chair-lifter – for bathing, showering, toilet, moving and weighing. The narrow chassis and the broad, ergonomically designed convex hygienic seat of soft, skinfriendly polyurethane enable residents who can walk to sit down in comfort. Less mobile residents can be taken directly from their wheelchair or bed and can then be transported gently and safely to the bath-tub, the shower, or the WC. The nursing staff are not exposed to health risks associated with strenuous lifting. The low chassis ensures that it can be driven under nursing beds. A detachable back support and all-round hand-holds provide the resident with additional comfort and security.